Many people call about potential visits to the ranch. Unfortunately, we are not open to the public. But there are other ways to experience and enjoy the animals we have to offer, and one of those options will be provided this weekend. Giddy Up Ranch returns to the Bass Pro Shop in Rancho Cucamonga this coming Saturday and Sunday. You will find us setup in front of the main entrance between the hours of 11:00am – 5:00pm. As usual, we will have camel rides, pony rides, and a petting zoo. We will also be introducing two of our newer camels, which includes our Bactrian “Harry” and baby camel ‘Wendy”. Speaking of babies, kids are in season. Bring your little ones to interact with ours. The petting zoo will be filled with baby goats, little lambs, piglets, guinea pigs and more. We understand that our mobile offers may not be in everyone’s budget, so we try our best to find alternate locations where you can come to us. The Bass Pro shop has become of those locations, and we make several appearances throughout the year. Be sure to always check the “visit us” section of our website, to find the dates of those appearances, as well as other locations to serve you. Grab your friends, family and cameras, and meet us there. Welcome our newest camel to Giddy Up Ranch. Our camel count has increased to five, and with distinct features, this new male stands out among the rest. Harry is neither the largest or smallest camel in our expanding caravan. And though he is the hairiest, it isn’t the long mane or bearded chest that makes him unique. He has two humps, unlike our other single hump members. He is our first Bactrian, or as I like to say, the first “letter B”. Bactrian camels originate from central Asia, which explains the difference in appearance. They are durable, wearing a thick coat to endure the colder climate, while also shedding in the summer months to withstand extreme heat and drought. So unlike their dromedary counterparts, you’re more likely to find this species in the world’s northern hemispheres. Harry arrived just in time for our live nativity scenes, and was an instant hit. Along with his beauty, he came with a personality to match. Just ask the folks at Palmdale’s Highland Christian Fellowship, who saw Harry go from a mere nativity piece to the star of the show. Always positioning himself to stare at the lens, he soon appeared in hundreds of Christmas Eve photos that would eventually be shared across social media. Though our other collection of nativity animals helped spring the birth of Christ to life, it was Harry that provided a long lasting memory for the winding line of churchgoers that were privileged to share his stage. So, what about that letter “B”? — A lot of people have a hard time pairing the hump to the camel, but there is a simple way to remember, if you just use the alphabet. Harry is a Bactrian, which is not only spelled with the letter “B”, but if you lay that capital “B” on it’s side, it appears as two humps. Dromedary begins with the letter “D”. The capital letter “D” placed on it’s side appears as a single hump.—–Got it? If you’re a place of worship, you don’t have to wait until December to reserve Harry and others for Christmas pageants and live nativity scenes. The sooner you book is the better, as all animals are subject to availability. December dates are reserved quickly, so be sure to secure your place on the calendar today. Camels are available throughout the year, for theme parties and special events. 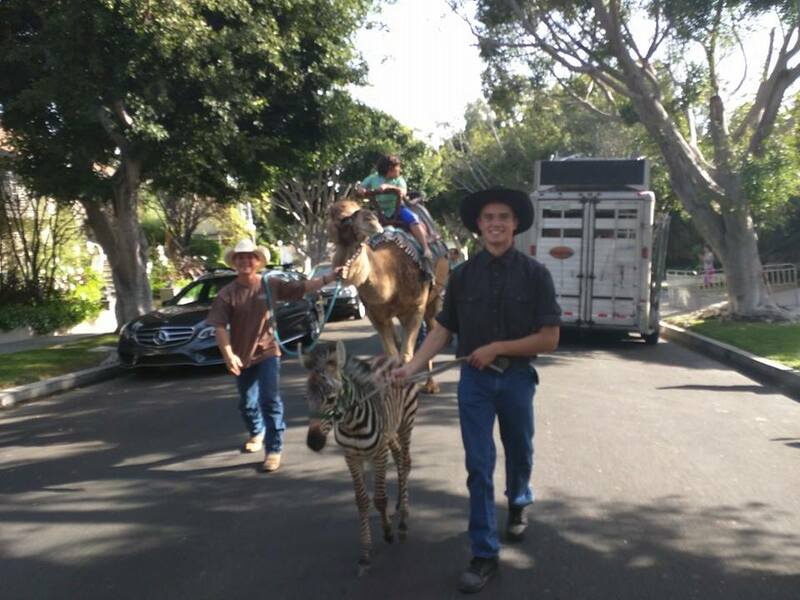 We can saddle them for rides or display them for photos, allowing the opportunity for you to “wow” your guests, educate your students, make a grand entrance or add to a film or video. If it’s “Mr. Personality” you’re looking for, ask for Harry, the newest addition to Giddy Up Ranch, and new memory for your scrapbooks and collage. Zebras are in the Equidae family, AKA, the horse family. Unlike horses, they are covered in stripes! Beautiful, distinct and unique striped patterns classify this mammal. Their stripes provide excellent camoflauge and protection in the wild. No two zebras have the same stripe patterns, just like no two humans have the same set of fingerprints. Underneath their stripes, their skin is black. 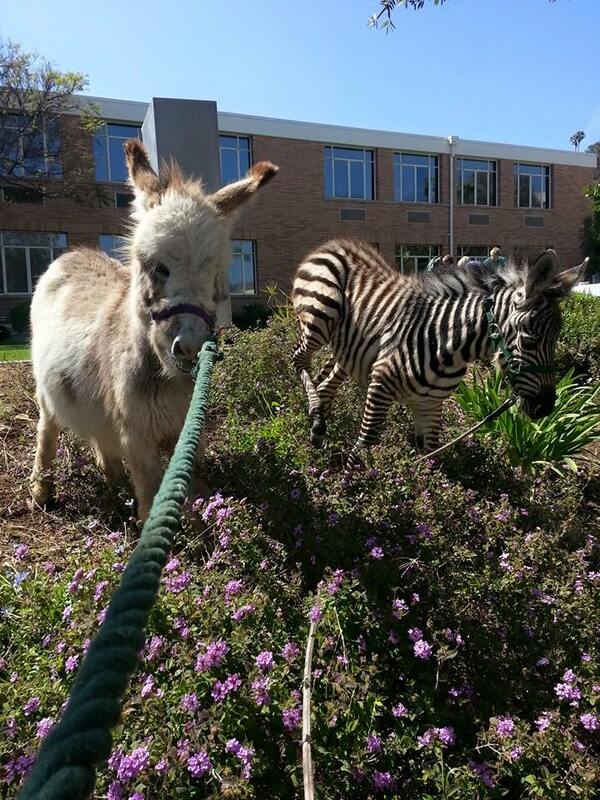 In the wild, zebras live in herds. 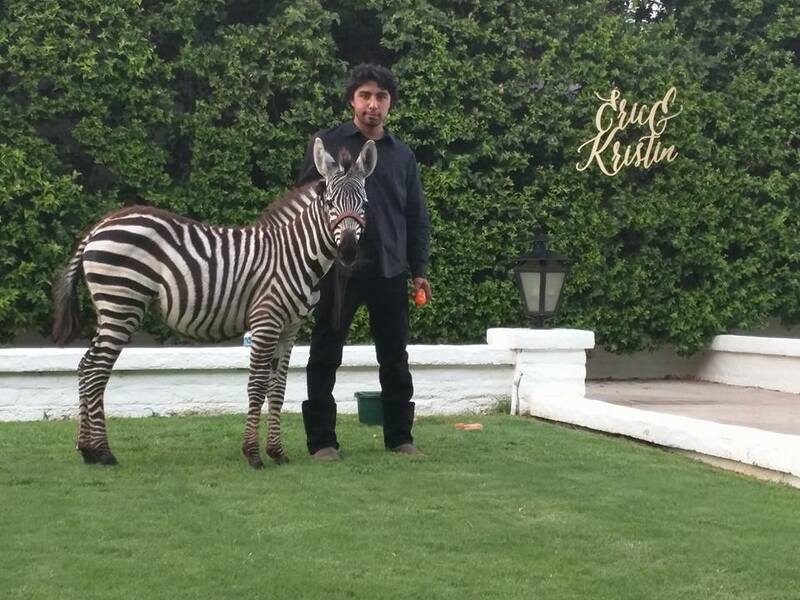 Here on the ranch, you will find Marty, our handsome little zebra grazing in the pen with the ponies. 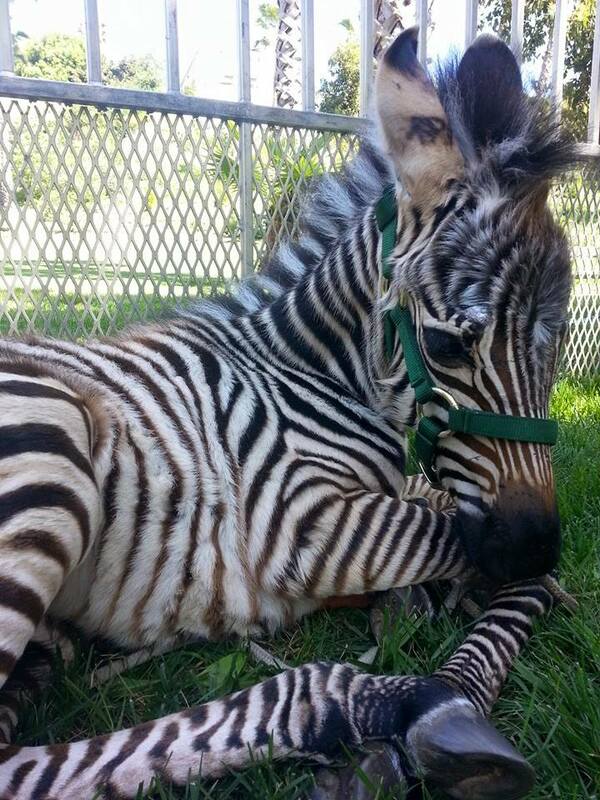 Zebra foals can walk only 20 minutes after being born! They have a life span of about 25 years. Zebras can run up to about 35 MPH. They make noises similar to a donkey’s bray or bark. 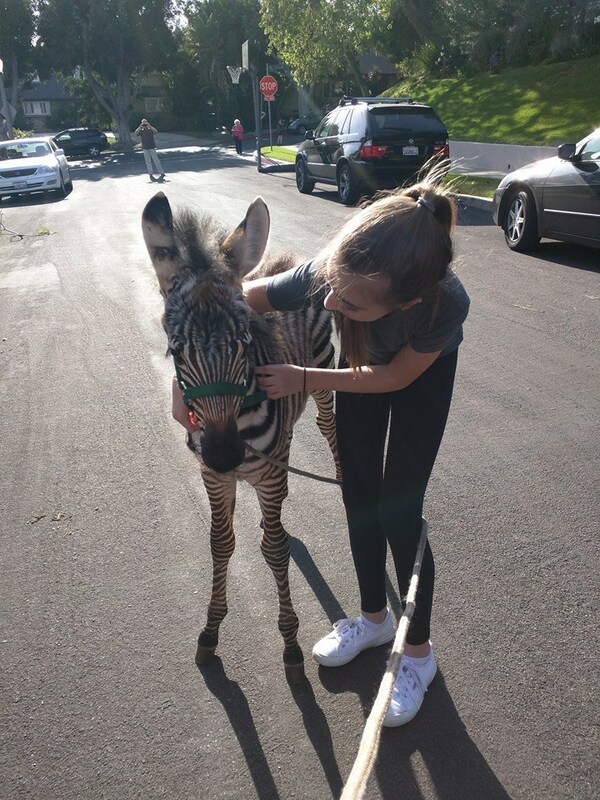 Not many people can say they’ve been close enough to a zebra to actually touch it. Book an exotic zoo and request we bring Marty along. It will surely be an experience you never forget!